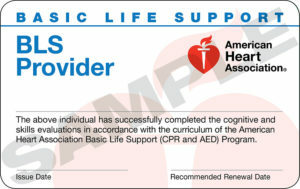 This course is designed for healthcare providers who are re-taking the course before their BLS Provider card expires. In the Instructor-led course, students participate in simulated clinical scenarios and learning stations. Students work with an AHA BLS Instructor to complete BLS skills practice. Students also complete a written exam. ***Blended Courses can be done on the same day. Please contact us to coordinate.